A Paper Read Before the Farmers’ Institute at Lansdale by Miss Mattie Reeder, of New Hope, on Wednesday, March 10th, 1897. It was a dreary day in early November. The scudding clouds had fought a triumphant battle with the wintry sunshine. Now the first snow was falling. The old, stone farm house, safe sheltered from the north winds by the surrounding hills and forest, was never known to close its door upon the tired traveler. To-night there seemed an extra bustle within its walls. A little stranger had that day arrived. “The baby is a girl,” the radiant nurse announces. “Another little girl, and I have so many little girls,” sighed the pale mother. And this was grandma’s welcome to the world. It was not a very warm one and at first grandma debated long the question, should she stay? Perhaps it was the beauty of the dancing flames in the great fireplace, or the tender mother love which cherished her, or maybe the awkward caresses of her blue-eyed brother that at length determined her. So the sickly baby grew into a rosy, toddling girl, whose life was as joyous and free as the song birds about her. And it is fragments from this girl[‘s] life of long ago that I will try to tell. It was a large family that dwelt in the spacious farm house. The first-born, a son, was looked upon with awe by all the youngsters. He was treated with almost the respect they showed to father. Then came a list of daughters who went by the name of “the girls.” And lastly grandma and her darling scapegrace* brother, who were known until both married as “the children.” This brother and sister, “the children,” the love that bound them so closely together, makes it impossible to tell the story of one life without also telling that of the other. Grandma’s one great trial of her childhood’s days was that she could not be a prim and quiet little maid like her sisters. She would run and romp, climb the tallest trees and whistle. Her little feet from spring to fall were innocent of shoes and stockings, except on First-days when it was her turn to go to meeting. Then, in a household of so many daughters there could not be a different dress and bonnet for each one. One costume did for many. So poor little grandma would find herself in a gown, either too long or too short and with shoes that clumped or else cruelly pinched her feet. But not withstanding this her day to go to meeting was always longed for and when over remembered fondly. It was ever wonderment to her grandchildren that grandma showed an unconquerable aversion to a yellow cat. One day the secret transpired. At the farm house, it appears, pet cats and kittens were tabooed. But one yellow kitten proved so engaging that the little fluffy thing crept right into the hearts of the children. When their secret was discovered the mandate was issued, the kitten must die and they must kill it. It did seem cruel but to disobey father or mother was never thought of. Grandmother and her brother held a sorrowful consultation. At last he had a brilliant inspiration. The kitten should be Arnold, the traitor, and be hung. Arnold deserved the fate and they, he argued, (not withstanding their friendly up bringing) would be doing a worthy act. Grandma gave a dubious sigh of assent and followed her leader. Arnold was taken to the woods with a tow string fixed firmly around his neck. The limb was chosen, the deed all but done, when “you wicked children!” screamed a shrill voice behind them. Turning they saw flying toward them an old woman, whose gray hair flew out behind her. She had thrown her bundle of sticks aside and shook her crutch in a menacing manner as she swooped upon them. “The Witch of the Woods,” they gasped in terror and fled. This old woman had long been known to them by fame. She lived alone in her wretched hut and how she existed none knew. But because she was old and poor and lonely she was called a witch and the name clung to her and helped make her shunned. She knew she was feared and her temper was sound, but she saved that kitten. Sometime after this grandma chanced to be alone in the forest when she again encountered the witch, gathering her daily bundle of faggots. With scant ceremony the old woman bade the little girl help her carry wood. Afraid to obey, afraid to disobey, grandma stood. A second command, sharper than the first, made her hasten to assist. Arrived at the witch’s hut she found her reward in a seed cake. There were no black cats to be seen, not black bag to hide little girls in and no superfluous broom-sticks. 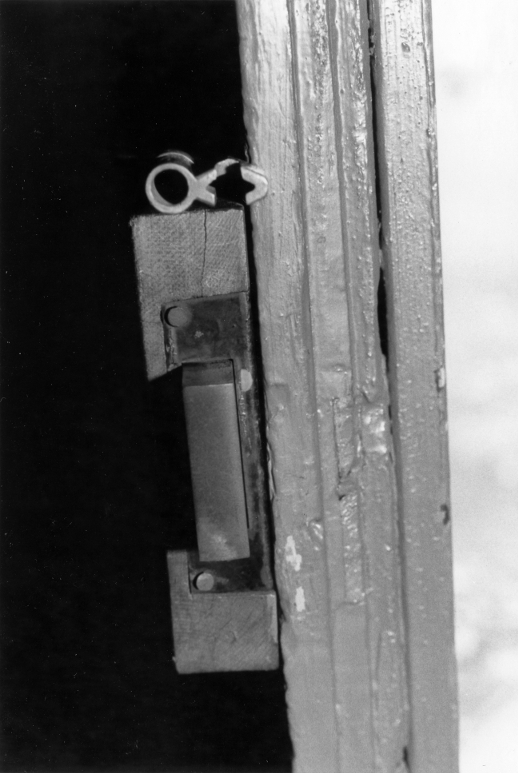 It was only the home of a poor, lame, old woman, and when a little kindness was shown her she proved not ungrateful. Perhaps it was pity or maybe it was the seed cake that made grandma from that time a visitor to the old Witch of the Woods. It was considered a misfortune by the children (and it was a misfortune) that they had no grandma. Other little people had and boasted to them and put on superior airs. Their pride was touched. Grandma pondered long on this perplexing problem; then it was solved. We would adopt a grandma, and no less a person was selected than the Witch of the Woods. This solution was rejected by her brother. He even teased her, calling her “The Little Witch of the Woods,” but she was not to be deterred. One of the older sisters had been sent to boarding school. With the knowledge there acquired she was expected to teach the children and she did so with credit. 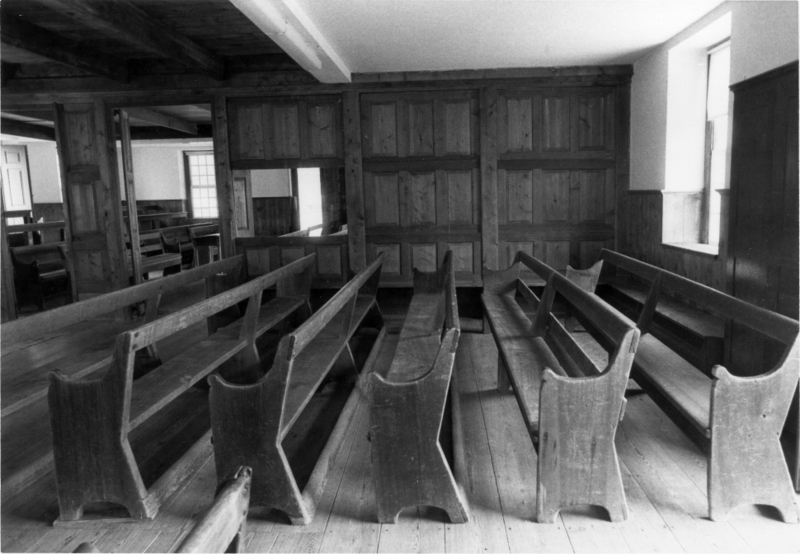 A summer school was held in a room over the wagon house and to her little people come from far and near. In the winter the big boys come and then it was an unwritten law that no girl should attend. Grandma was quick at her studies and was loath to leave. She timidly petitioned to be allowed to attend the winter session. But her father’s stern “What does thee want among a parcel of big boys” effectually silenced her. Nevertheless, her brother went and grandma secretly pored over his books and kept pace with him. 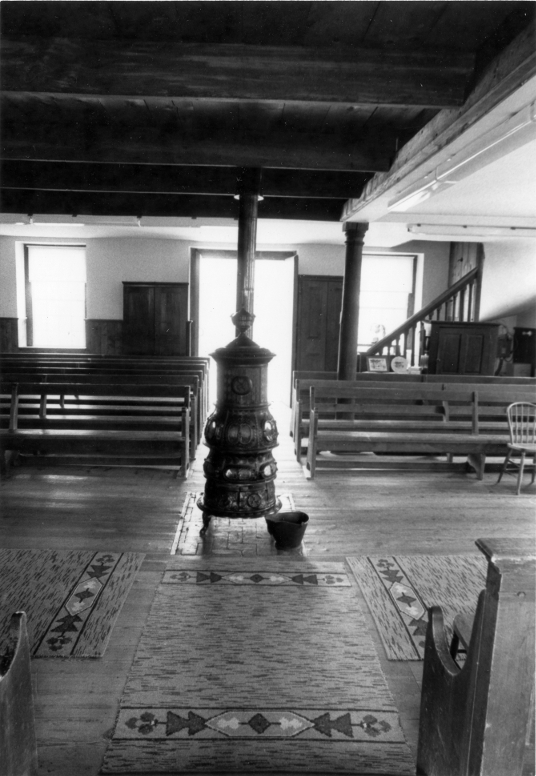 One time when the father and mother attended yearly meeting her brother was taken with them. It was their first separation, and grandma felt it keenly. But the joy of the return! She learned then she had not been forgotten. With his scanty, hard-earned pennies her brother had bought her a china mug. And enclosed by a wreath of flowers were the words “For My Favorite.” As long as she lived this mug had a place among grandma’s greatest treasures. But all this time grandma was growing. She was no longer “The Little Witch of the Woods.” She was learning the art of spinning, of churning golden butter, and the mystery of cooking was no mystery to her. In all household affairs the careful mother trained her daughter. And she was such an old, old fashioned mother that she taught her to look forward to the time when she should be married, and helped form her so that she would perform the duties of a wife nobly and well. There was already a goodly store of linen, spun by grandma’s girlish fingers and laid carefully away for her “outset.” And as she sat by her wheel, spinning, spinning, many must have been the gorgeous day dreams of the coming of the prince. All the older girls were married, and her father jokingly had told her she must not ask for her outset for those three years. Then grandma was only dreaming, but at the end of those three years her father was seriously reminded of his joke. Grandma’s brother had grown into a tall young man. He was something of a dandy and went to see the girls. 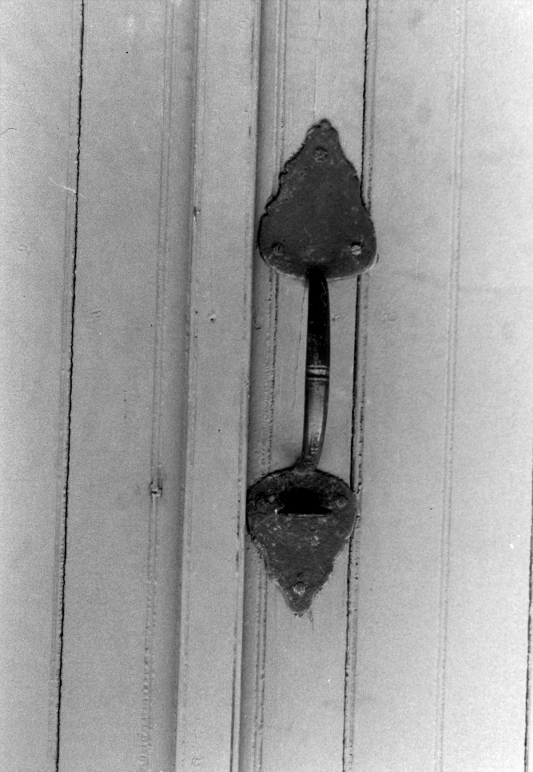 Often his gay companions came to the old farm house. Neither their coming or their going troubled grandma. 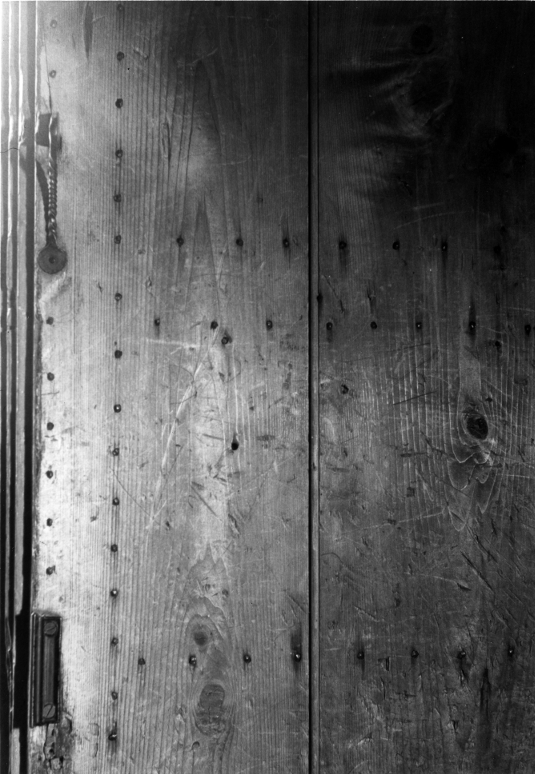 She had not yet asked herself the question, “Am I a child or woman?” One day seeing her brother’s team drive in the door-yard, she left her work and ran to meet him. Too late, a strange young man, she saw, was with him. [And she] stood spell-bound for she looked upon her prince. Then she realized in one brief instant that her home-spun dress was old and faded. That her curly hair was dreadfully tumbled and oh, what should she do! She had on neither shoes nor stockings. At this crisis, without a word and with cheeks of crimson grandma turned and fled. But the prince had only seen her face. This I think proves quite plainly nature had been very kind to grandma, since it took so little to make her charming. Still, great was the disgust of her brother. “What had made her behave so simple?” Alas! she did not know. “What would his friend think of the sister he had been so highly praising?” Grandma was silent, but she only wished she knew. Meanwhile the father and the mother saw their daughter bud into a woman and they gave her the outfit suitable for a young woman of her day. To transform this merry girl into a stately lady they bought her one silk gown, a cotton print, a pair of long silk mit[t]s, a shawl and bonnet. And grandma over this modest wardrobe had just as many raptures as girls of to-day. When she stood arrayed in her gown of silvery gray her thoughts wandered to the prince and she could not help sighing, “Oh! If he could only see me now.” But the prince did not forget her. He began to come quite often to see her brother. At least the brother thought so, and took upon himself all the entertainment, while the poor prince suffered torments. Demure grandma saw it all, but would not help him. But at last grandpa (Oh! the prince) by means of schemes the darkest and efforts mighty succeeded in escaping from this now tiresome brother. But when this poor deluded brother saw his friend walking with his sister he was blind no longer. Then came grandma’s courting days. But of the long rides, the walks, the talks grandma and grandpa had together grandma would never tell me. She was growing old, she said, and it was all so long ago she could not remember. And that was the first and only time that I could not quite believe her. *Scapegrace: a mischievous or wayward person; a rascal. The grandmother in question is Letitia Blackfan Betts. 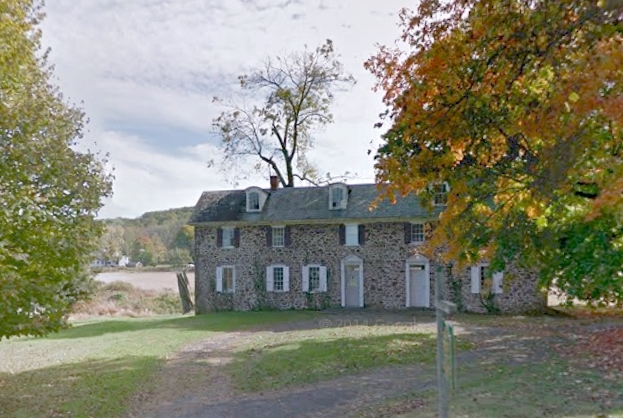 Her father Stephen Betts settled in Solebury in the late 1700s, and the Betts homestead remained in their family for more than a century. Letitia was born on November 11th, 1801, and grew up on her family’s farm on Stoney Hill Road. Her younger brother John, with whom she was so close, was born in 1804. Letitia married her suitor Joseph Eastburn Reeder at Buckingham Friends Meeting on April 11th, 1824. 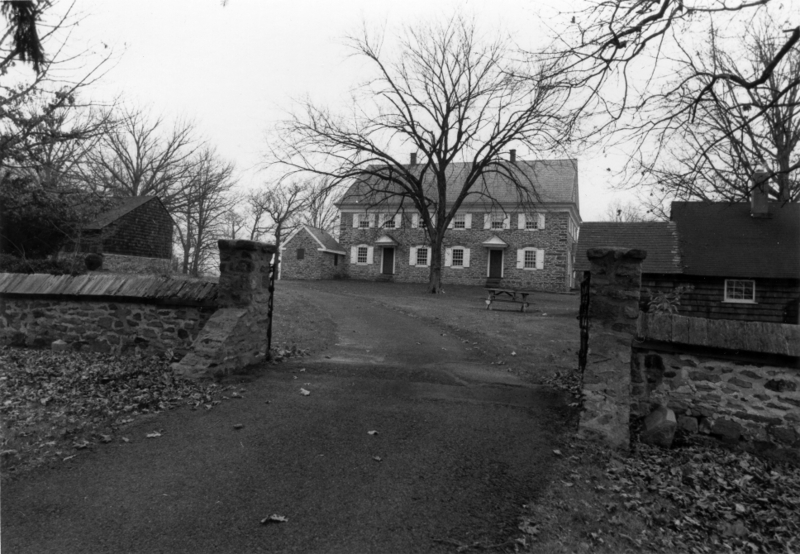 The farmhouse, which still stands today, was located between Stoney Hill and Aquetong Road. 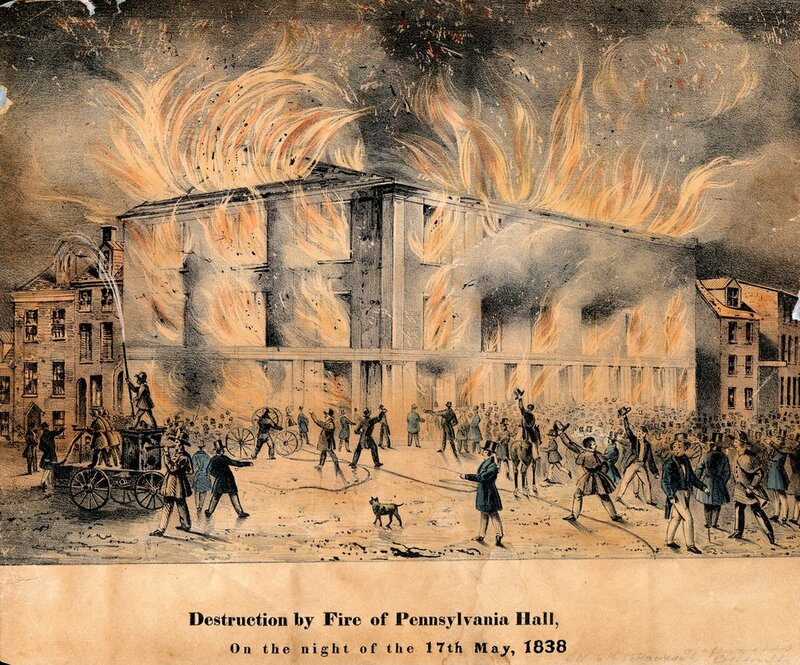 Tonight marks the 176th anniversary of the burning of Pennsylvania Hall, which was razed by anti-black rioters a mere three days after it opened in May of 1838. The building was erected in Philadelphia by the Pennsylvania Anti-Slavery Society, and at the time of the riot they were hosting the Requited Labor Convention, which brought together various regional anti-slavery societies. 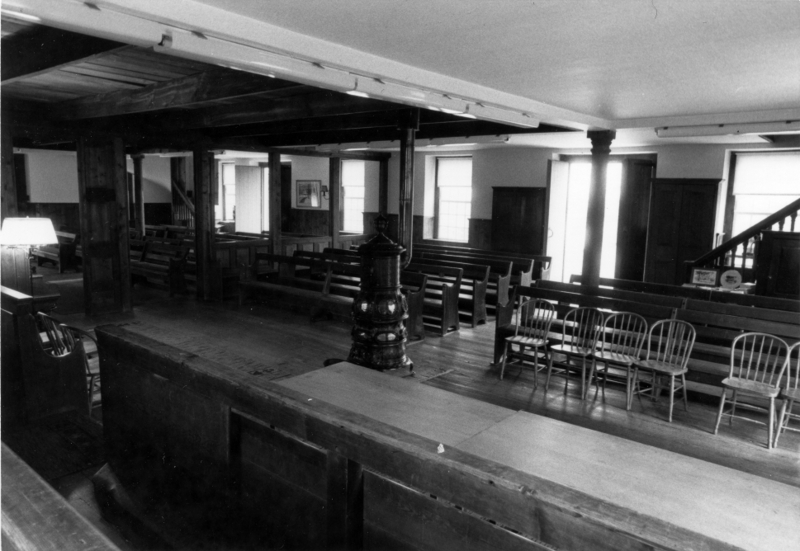 A number of Bucks County abolitionists were in attendance when the hall was destroyed. 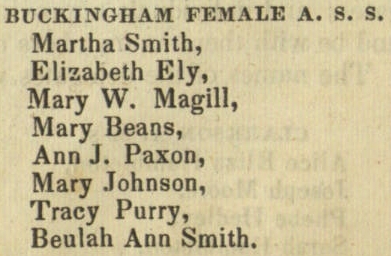 The convention minutes list delegates from the Bucks County Anti-Slavery Society as well as the Buckingham Female Anti-Slavery Society. 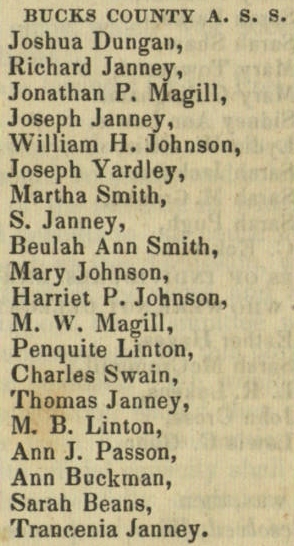 The delegates include people who were very active in the Underground Railroad in Bucks County, including William H. and Mary Johnson of Buckingham and Jonathan P. and Mary W. Magill of Solebury. After the convention was reconvened in September, William H. Johnson was elected as one of the convention’s vice-presidents. 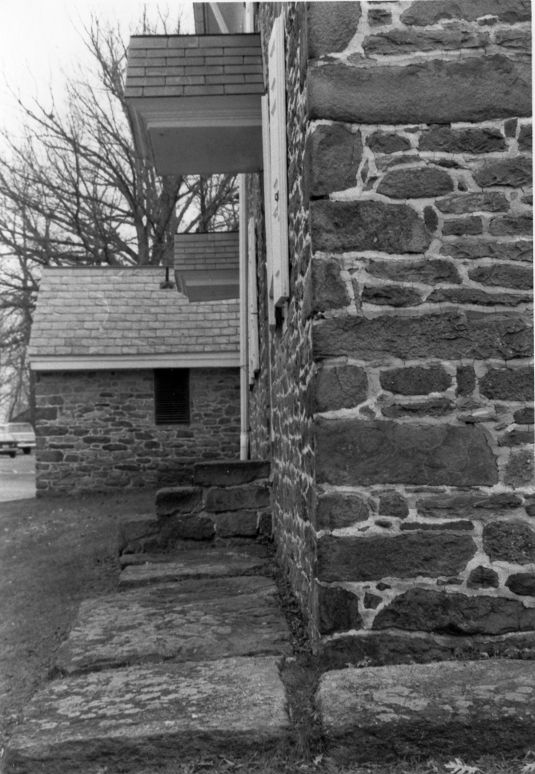 The Magills’ son Edward H. Magill would later write the most complete history of the Underground Railroad in Bucks County, “When Men Were Sold: Reminiscences of the Underground Railroad in Bucks County,” published in the second volume of A Collection of Papers Read Before the Bucks County Historical Society. 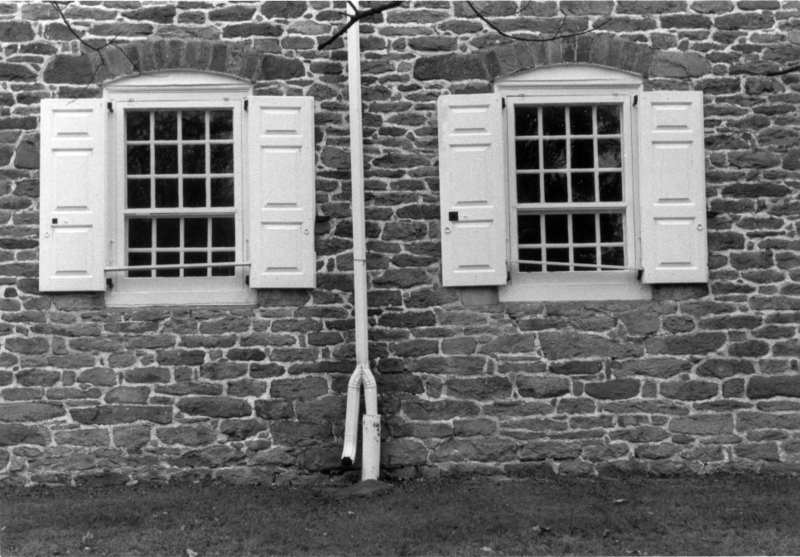 These photos were taken in November, 1982 by Georges Duval, who was also responsible for saving the collection of 18th and 19th century Quaker documents that I recently deposited at the Friends Historical Library. These photos were included in that donation. 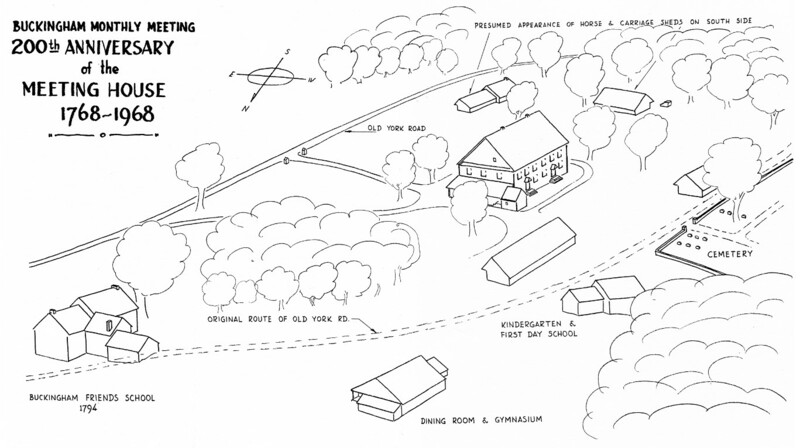 Did you know that York Road (Rt 202) originally ran behind Buckingham Friends Meeting? This map originally published for the meeting’s 200th anniversary in 1968 shows the original route. A few months ago my grandfather decided to a do a little spring cleaning. There was a storage unit in our barn that hadn’t been touched in years, full of mildewy furniture and worthless miscellany. He came across a metal container full of maps, mostly showing local topography and zoning. My aunt suggested that I might want them, so they escaped the trash heap. When I got down to the barn I found a pile of mostly junk, covered in a plastic tarp because we were expecting rain. I found a few items worth keeping: the sled my great-grandmother had when she was a little girl growing up in Battle Creek, Michigan, a wooden tricycle that belonged to my grandfather, and a few plastic trucks for my son to play with. I found the box of maps and popped open the latch, and immediately knew that the contents were far more important than my grandfather had realized. There were dozens of maps, but among the rolls of paper I recognized a draft of the map my great-grandfather made for the Solebury Friends Meeting burial ground in the 1960s. 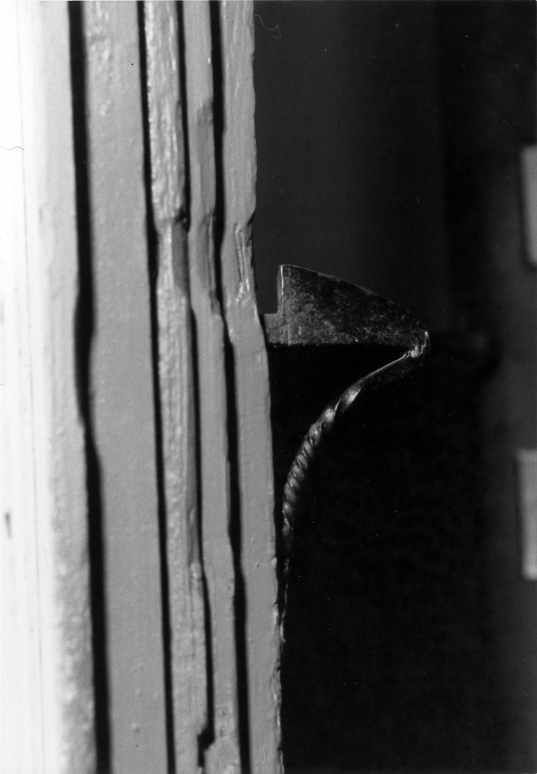 Then I noticed another roll that was clearly a much older material. With the box sitting in the gravel driveway, I rolled the map out a few inches and discovered that it was in fact two maps rolled together. The first was from 1907. The second was from 1866. They were the original maps that by great-grandfather used as a reference for the modern map, and they’d been sitting in our barn for decades, totally forgotten. 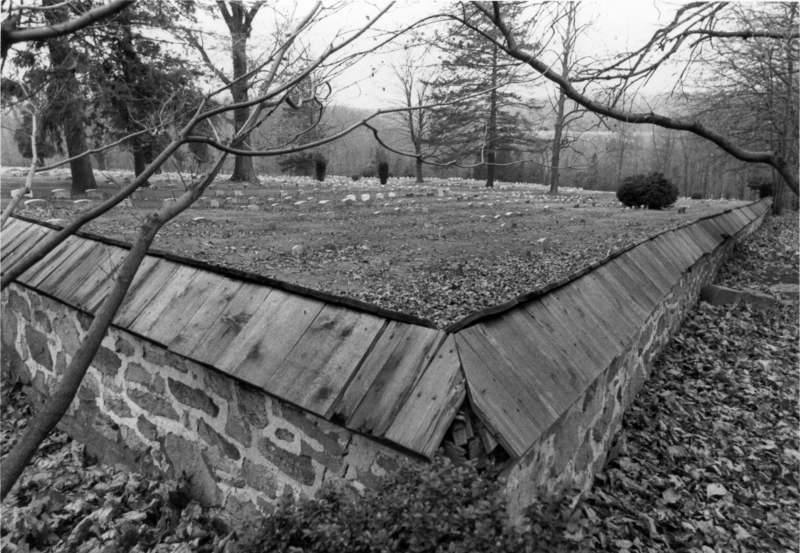 I called the person currently in charge of the graveyard to tell him about my find and offered to bring it to the Friends Historical Library at Swarthmore College to deposit it with the rest of the Meeting’s original records, and I held on to them for a few months until I had time to make the trip. A couple weeks ago I finally I finally had a day off, and decided to bring the maps to Swarthmore. My timing was fortuitous. That Monday I led a graveyard tour at Plumstead Friends Meeting. 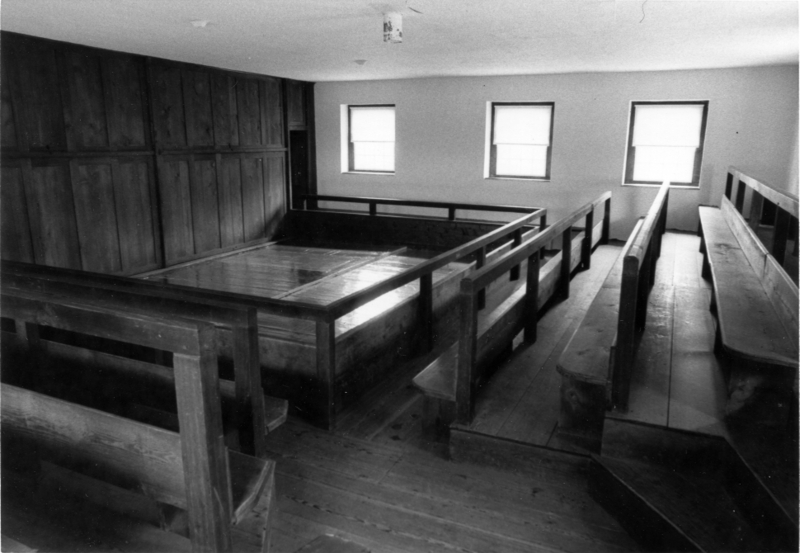 We assembled in the meetinghouse, and as I led the group outside towards the burial ground, a woman approached me with a box of documents about the meeting. At the time I was too focused on the tour to discuss it, and suggested that she talk to the clerk of the meeting. The next day, however, I was consumed by curiosity. I already had plans to go down the the Friends Historical Library that week, and thought I might be able to bring those papers as well. Luckily I ran into her in Doylestown a couple days later and proposed that I take them for her. She agreed. When she dropped the documents off the next day, she brought a lot more than the Plumstead material. She also brought a collection of documents from Buckingham Meeting, and there was so much that it took her two trips to unload it from her car. 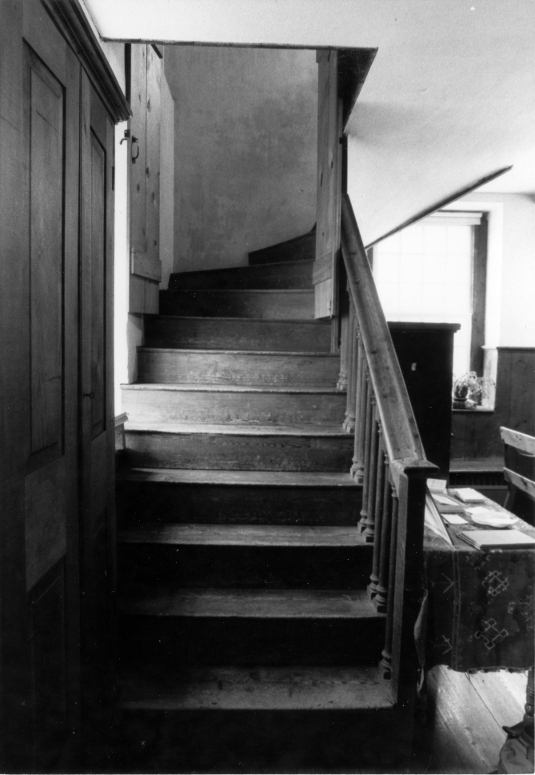 The Plumstead material turned out to be the notes and research prepared for a pamphlet published for the meeting’s 225th anniversary celebration on 1953, as well as notes about the ceremony itself. 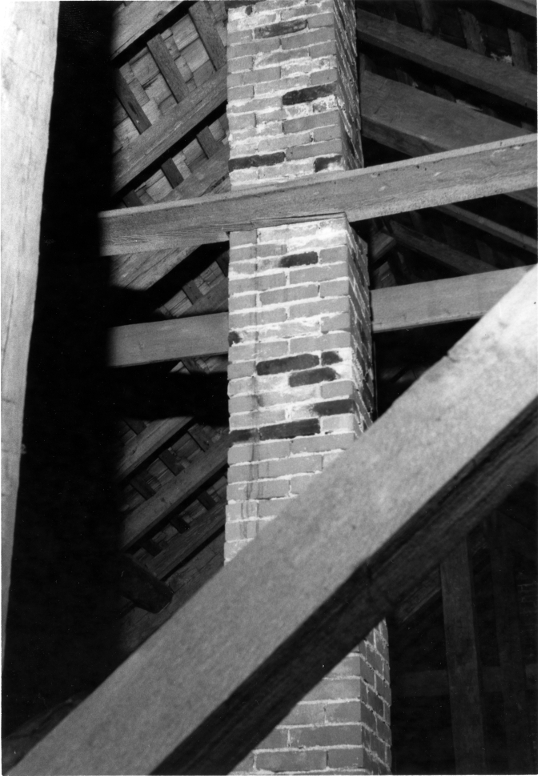 There were also two large photographs that were used in the pamphlet, one from c.1875, and one from 1953. The Buckingham material was rather varied. 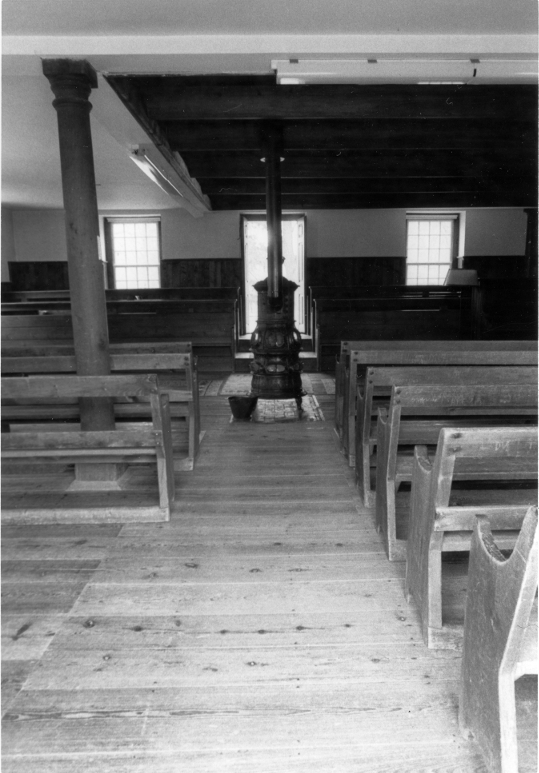 One box contained about a dozen copies of the book published for Buckingham Meeting’s 225th anniversary in 1923, as well as a block print of the meetinghouse that was used for that book. There was a folder with newspaper clippings and other 20th Century material. Finally, there was a cardboard box that had been saved from Buckingham Meeting by the woman’s father. At some point a few decades ago, the members of Buckingham meeting had decided to indiscriminately “clean” their attic, and this box was a subject of the purge. 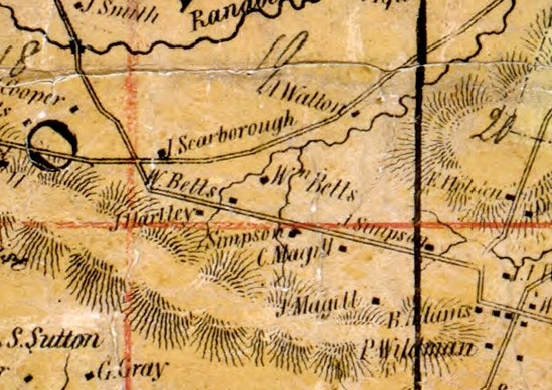 Like the burial map from Solebury, these documents were almost destroyed. When I opened this final box I got goosebumps. I could tell by looking at the parchment that they were old. Really old. Most of them were tied together with string into little bundles, with a few groupings of loose papers between them. I saw the date “1776” peeking out from one of the bundles. 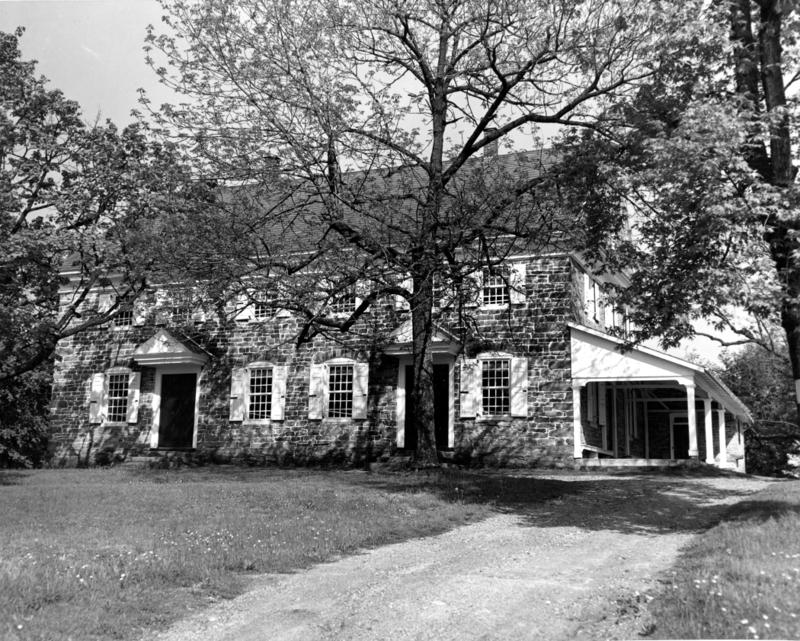 When I brought them home and examined them further I found that some documents dated back to the beginning of the 1700s, and in addition to material from Buckingham, a lot of the documents actually came from Middletown Monthly Meeting. Most of them were excerpts from annual conference of Philadelphia Yearly Meeting, and epistles from the yearly meetings in London and Philadelphia. Some were testimony against members of meeting, or letters from people willingly leaving the Society of Friends. There were a few more recent documents that dealt with the Civil War. Perhaps the most interesting document is a letter written from a Quaker aid mission during the British occupation of Boston. She had kept them in storage for years, hoping to eventually deposit them in the archive, and I was finally able to bring them for her. 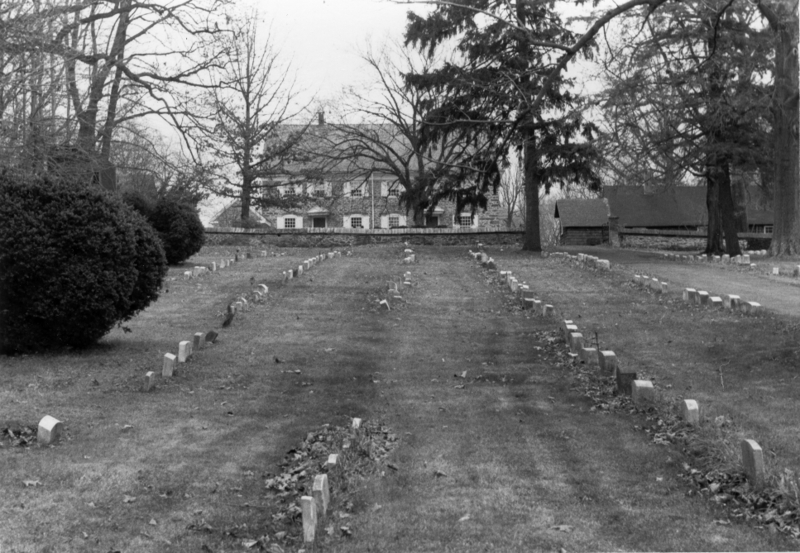 Third-month 25th, 1808… the Friends appointed to enclose the burying ground, report the service nearly performed, and a committee was appointed to consider proper directions to give the grave digger and in what manner the dead shall be interred in our grounds. Ninth-month 27th, 1808. Finding some difficulties to arise from this plan for burying, Friends reconsidered it, and decided that all transient persons who may have liberty to bury in our grounds, and not properly claiming a square, ought to be interred in a row on the east side of the burying ground, beginning at the northeast corner. This is the origin of the strangers row. The grave-yard has been twice enlarged. 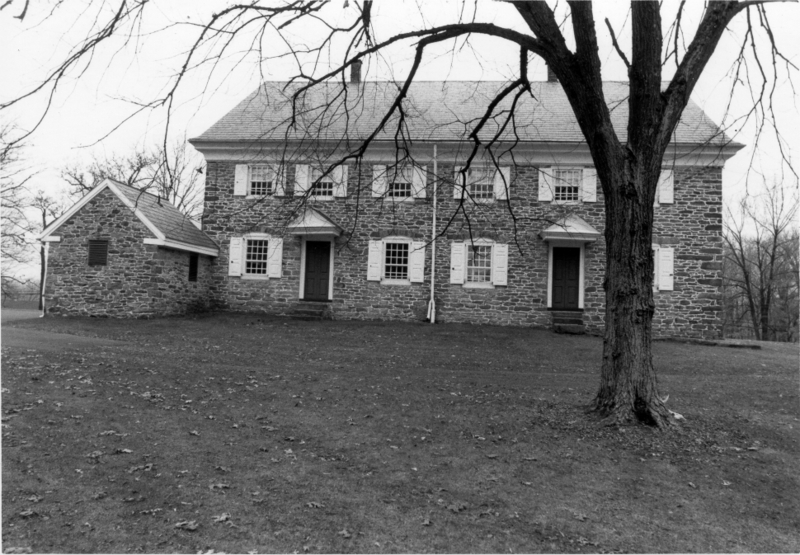 The first time in 1830 by the purchase of 80 perches of Aaron Paxson, Jr. 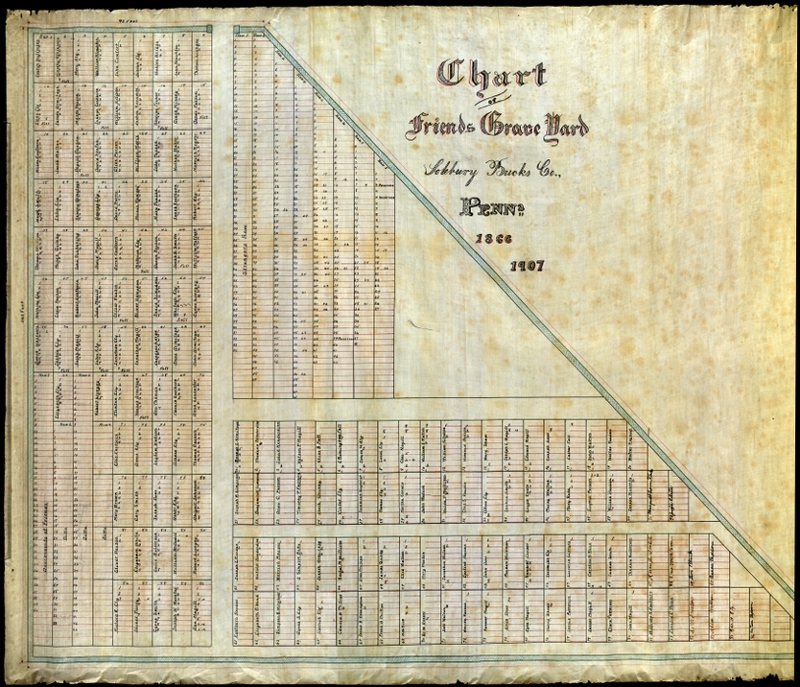 The second time in 1877 by the purchase of one and a half acres of Merrick Reeder, making the whole amount of land now owned by the meeting over 5 acres. Thanks to Reeder we have the original plan for the allotment of the graveyard, and we can appreciate the sympathy of these original Friends who set aside a burying place for people who had nowhere else to turn. 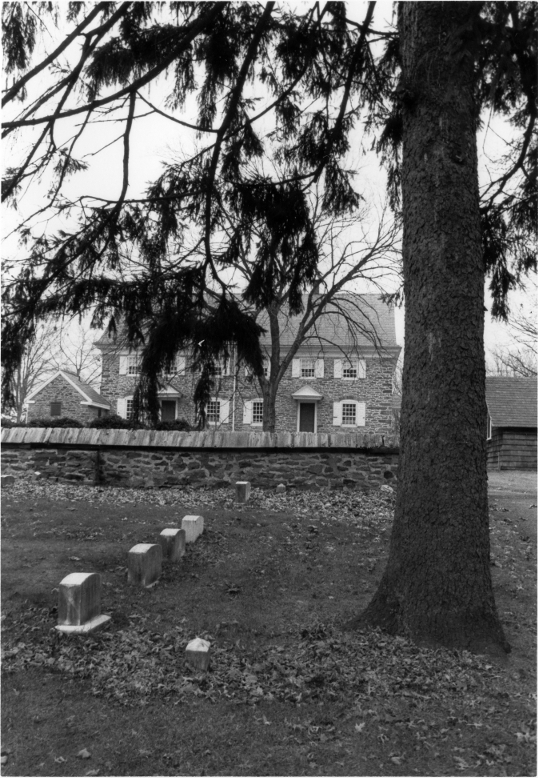 Reeder’s history of Solebury Meeting also illuminates another intriguing aspect of Quaker history: the shifting opinions within the Society of Friends with regard to the recognition of the deceased with grave monuments. 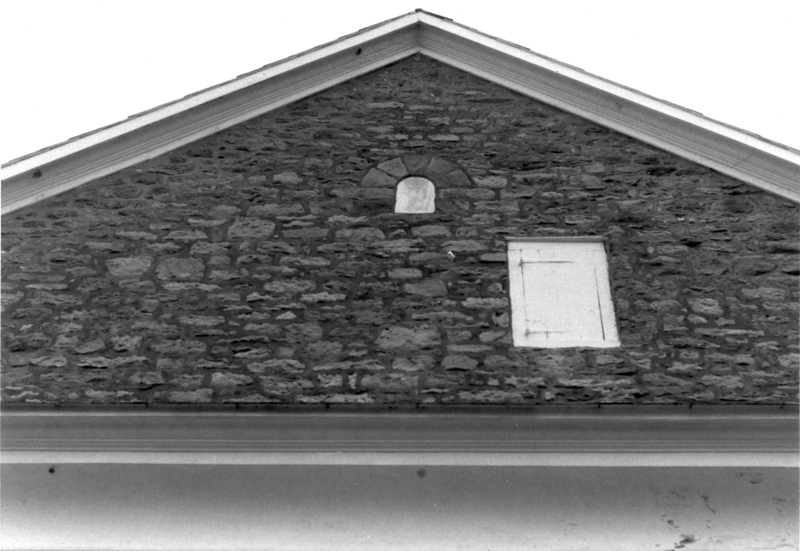 In keeping with the testimony of simplicity, early Friends erected plain, unmarked headstones or no stones at all. 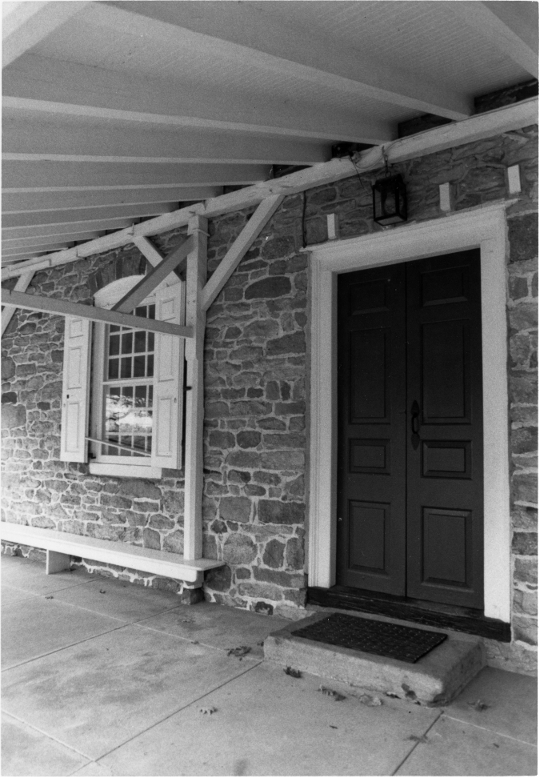 At Solebury Meeting, you’ll find these simple brown slabs of local stone in the oldest section, located in the northwest corner. Eventually initials or names were added, but it wasn’t until the second half of the 1800’s that engraving the name of the deceased with their dates of birth and death (and consequently the use of marble and other easily engraved stone) became standard practice. 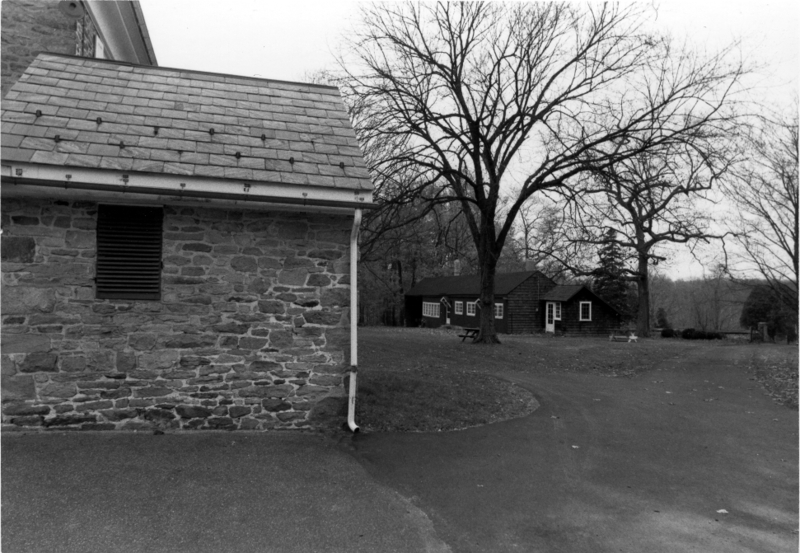 Viewing the list of graves at Solebury Meeting (available here), the recording of dates seems to begin in the 1860’s. I can’t help but think that the Civil War transformed the Society’s views on death and remembrance. After consideration fo the report was adopted, and Moses Paxson, Oliver Hampton, Oliver Paxson, Aaron Eastburn, Hugh Ely, Aaron Paxson, and John Comfort were appointed to use their endeavors to induce such of our members as may have placed monuments to graves, to remove them, or consent to their removal.